“She Ordered What?! ?” The birthday booze edition! I am delighted to introduce y’all to a very good friend of mine. Dana wrote her first blog post – ever! – and she did it for “She Ordered What?!?”. You’ll definitely get a feel for why I like this woman so much, as her personality comes screaming off the page! Coming from opposite parts of SE Michigan, we agreed to meet in the middle. In this case, it was Michigan Avenue in Dearborn. Several options were tossed out there…Canada, Ferndale, Livonia, but in the end, proximity trumped all! There are several bars, restaurants, and even hookah lounges in this three block stretch. The location provided a plethora of options for this easy-going posse. We met up at Bailey’s (a popular sports bar), and over a cold beverage, we decided to find an outside patio…the night was beautiful. The Well was calling our name. It was still early in the evening, approximately 10:00. The Well has a few patrons on the inside, but we opted for the empty patio. A sign by the gate announced a drink special…The Drunken Sailor. The name alone was intriguing. Being the adventurous lassie that I am, I ordered it despite the waitress’ lack of knowledge of the drink. Thought to myself, “How bad could it really be?! ?” While we were waiting for our first round, a young man came out to welcome us to The Well and made sure we had been taken care of. He introduced himself as Nick. We asked him about the drink. He said it was a shot that he created with Captain Morgan, Root Beer Schnapps and a few other ‘secret ingredients’. I was delighted to hear, as I’m a fan of all of the above! 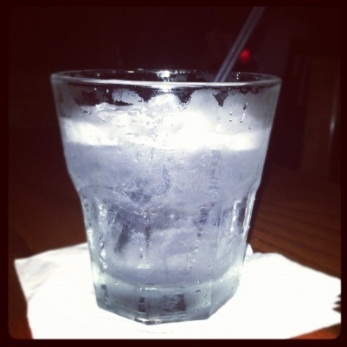 Our waitress delivered our drinks, a glass of Merlot, diet Coke, water and my “DRINK”…not a shot. Now, I wasn’t disappointed because it wasn’t a shot, it just wasn’t what I was expecting. Sidebar… This is where ordering something specific has its faults. You have a preconceived notion of what you’re getting. Let them decide and you have no expectations. Back to the story…. My friend Melissa happened to run into Nick on her way to the restroom and commented, “Wasn’t that Drunken Sailor supposed to be a shot, not a drink?! ?” He apologized, while explaining he was not the one who made that particular order, and offered to bring a round for our table. Since 2 of the 4 of us had ordered alcoholic beverages, Melissa accepted the offer for two shots. A few minutes later, out comes Nick with three shot glasses. Nick pulls up a chair, offers the Sweet Tart shots, which of course I accepted without hesitation. And then picks up a shot glass of water for himself; a quick clink of the glasses, and down the hatch. Nick apologized to me for the error, but assured me that he made THESE shots and hoped that they were satisfactory. He further explained that he had recently taken over partial ownership of the bar. Needless to say, I was über impressed with this young man’s charisma and professionalism, especially for appearing so young! Further proof; don’t judge a book by its cover! After a bit of chit-chatting, we decided to head back down Michigan Avenue to feed our meters (it’s a Dearborn thing, folks!) and catch a live band at another establishment. Within that hour, half our group decided to retire for the evening and head home. Melissa & I… well, we decided the night was still a bit too young for us! We headed BACK to The Well and thought we would give Nick a run for his money, or at least that was MY plan. We arrive back at The Well. I was pleased to see the crowd had grown. The DJ was awesome and played a great mix of current, with a throwback here and there. Remember “OPP”?!? So did this DJ! I walked up to the bar and Nick greeted us with a friendly wave and smile. Melissa, being the responsible one, ordered her Diet Coke and I ordered a “Surprise Me!” He didn’t pause for a minute and went straight to work. Moments later, he returned with a glass of purple bubbly goodness. My first surprise was a “Grapealicious” drink. Bet you can probably guess how it tasted! EXACTLY like grape bubble gum, just liquid & cold. But this was no kiddie cocktail! It packed a punch. I was initially concerned that it was going to taste like grape cough syrup, but was pleasantly surprised. I would get it again, but only one per night, as it was VERY sweet. Surprise #2…the “Chocolate Covered Pretzel”, almost had me doing the Mambo #5. It was like a symphony to my palate. A well-balanced mix of sweet & salty, with the sodium chloride encrusted rim! 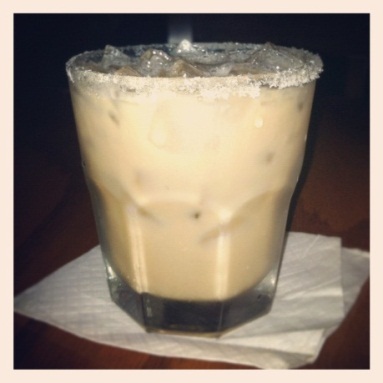 The smooth chocolate liquor with the creamy half and half, combined with whatever else was in this scrumptious beverage, topped my leaderboard of favorite drinks! But drinkers beware…it’s another strong one. As Nick circled the floor tending to his patrons, he stopped by our table. I figured, “What the hey?!? How many 29th birthdays can a girl have?! ?” Apparently many, as this was my 5th! Yet again, I left my final drink in the very capable hands of my new BFF! He nailed it with this one! I asked the name and he said it was just something he came up with and really likes, said it’s very refreshing. At this point, the water-based drink was EXACTLY what I didn’t know I needed! 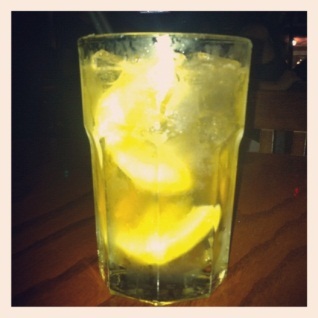 It had a shot or two of sweet tea vodka and lemon juice. Very smooth and yes, VERY refreshing!!! If you take anything away from this blog post, I implore you to pay special attention to these two things! First, if you’re going to enjoy a night out, PLEASE…PLEASE…PLEASE do so responsibly! It only takes a second to change the rest of your life and potentially the lives of others FOREVER! It’s just not worth it! Designate a driver BEFORE you head out and stick with that plan OR call a taxi! The expense of a cab doesn’t even compare to the cost of a DUI or worse, DEATH! Having said that, I would like to say an extra special thank you to my dear friend Melissa for taking one for the team and being my DD! I owe you one, toots!!! 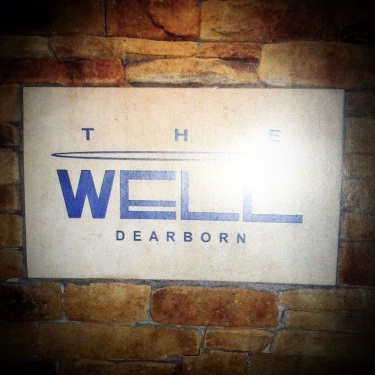 Second moral of the story, check out The Well in Dearborn. If you have the pleasure of meeting Nick, tell him to ‘surprise you’. You won’t be disappointed! Thank you for reading and I hope you enjoyed! Cheers to all, and to all a safe night!! P.S. I never claimed to be a photographer; especially not at 1:45 in the morning! But, I would be remiss if I didn’t include this one and “TRY” to give credit where credit is due. Please excuse the FLASH!!! Again, I’d like to say a special “Thank you” to Dana for sharing her story, and for bringing a new perspective to this blog. And, another belated HAPPY BIRTHDAY girlie! Dana, this was so enjoyable to read!! You are a wonderful writer!! I agree, Jenny! Dana has a future in blogging! KK…I have two more in the works 😀 Each experience has been a blast and writting about them makes them even MORE memorable! Kudos to you for all your hard work in creating the site and getting this out to the masses!!! Thanks for the kind words, Jenny! I tend to write as I would speak, and therefore, uncertain how my thoughts will be received. Some thoughts get ‘lost in translation’ 🙂 Have happy to hear you enjoyed it! Dana – Next time – be sure to ask for Chris Thompson or Dale Gehringer – they are the owners (that I know of) and former Romulans 🙂 (Romulus High School) Love it there! Hey Amy! Next time I go there, I’ll be sure to ask for them. Good to know! I like to support local entrepreneurs & how awesome they are from Downriver! Love it there too!!! Dana… It felt like I was sitting right next to you there…… Sounds like you have a very fun night!! !